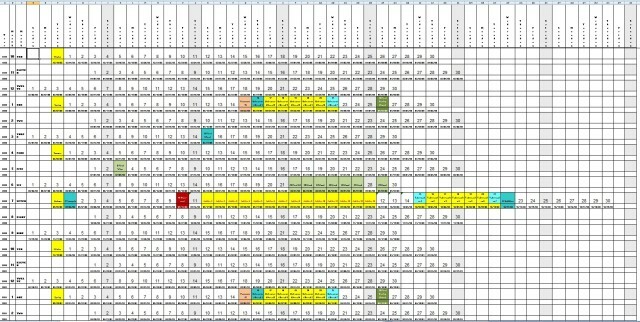 Qumran Jubilee Year Calendar Matrix. Screen print courtesy M.A. Hook. The number of days in each year varies according to a variety of factors. Here is the matrix that the astronomers under King Hezekiah’s directions devised to account for those differences that changed after the shadow on the sun dial went back ten degrees. The chart is a bit hard to read without instructions, as the first seven years always occur in order, but the Jubilee year is only inserted after every 49th year, so that they stand in columns by themselves in the position most persons are familiar with being a summation of the prior data rather than an extension of them. There is another point that Bishop Usser failed to take into account. The count of years is NOT started at the creation of the earth. It is started when kingship was transferred from the giants to mankind, specifically to Noah after the Great Flood, giving him the title of “King of the earth and friend of the gods,” which Shem inherited and then named Abraham to inherit after his death. The human lifespan was decreasing so rapidly, and Abraham was born into the tenth generation, that Abraham died of old age 35 years before Shem was murdered by Isis. The giants have been here for well over 400,000 years, and the earth was old when they arrived. As mentioned in a previous post, the year 2000 Gregorian is the same as the year 6000 Qumran, which is not reflected in this matrix, but since the pattern is consistent back to Hezekiah, it’s safe to match any section of it to any section of the Gregorian calendar as long as the line marked “*Jubilee” is matched to a year that is evenly divisible by 50. Another peculiarity of the matrix to notice is that every 350th and 700th year, only 7 days are added to the calendar. This is equivalent to the year 2000 when no leap-day was added to the Gregorian calendar.